Based on a Music box, when played by a member of the audience triggers 4 motors to starts turning. A camera captures the movement and projected on the screen. Usina Mekanica, (UM) performed by Fuse En­semble, is a conceptual new music/new media happening involving live musicians, kinetic objects and video generated in real time. In Collabora­tion with Workingman Collective. 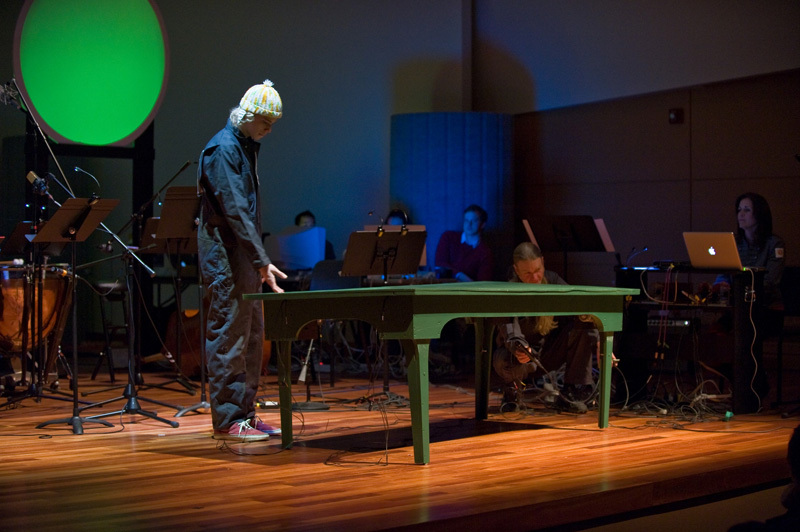 UM uses live-action wind-up toys -- their sound and images manipulated and reintegrated into the performance space via real time video and audio to propose a psychological landscape for the au­dience. UM is a multilayer performance that uses as source material the possible relations of man and machine while playing on childhood memo­ries to trigger notions “estrangement” of the nurs­ery rhymes and emotions provoked by the indus­trialized clanking of the metal wind up machines. While Edgar Endress manipulates the videos in real time via Max MSP, new music by Gina Biver and Jorge Sad forms a soundscape with live mu­sicians and electronics that evokes not a single childhood memory but a mental landscape -- a context of the meanings held within these memo­ries, real or invented. Musicians of Fuse Ensem­ble interact with the toys and the tactile sounds they create while the Toymaster directs. The wind-up machines move about on an elaborate kinetic table created by the Workingman Collective that follows the mechanical theme by being able to move on its own – even becoming an instrument itself at one point. The table serves as a known communal space that bridges the two layers of in­vented psychological landscape and the mechani­cal devices themselves. 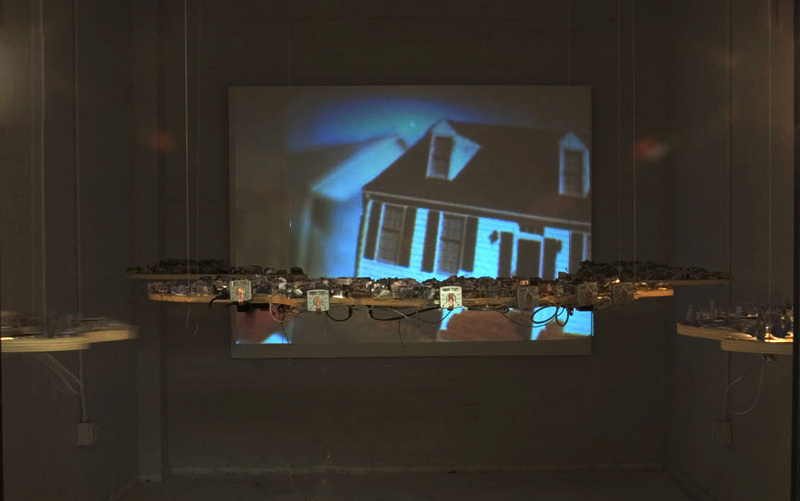 This is an installation that explores several aspects of American culture from the perspective of the house as one of the foundations of the American dream. Embedded in the American consciousness are the ideas of access and ownership as democratic principles that sustain the principles of progress and wealth. The house is ultimately also a cornerstone of national identity and territorial belonging. For the Daily Settlement installation, free real estate magazines were used for the construction of a grandiose landscape. The houses in the magazine were cut around the sides and top and folded to stand, creating an expressionist landscape replicating communities. The communities are a promise, that latent possibility between being or non-existence is the one that articulates a fictional narrative story where the psychological formula of the music transforms the scenes into a dramatic narrative, as in the moment before an apocalypse or the final encounter. The word Settlement implies three meanings: resolution, payment, and community. All of them participate and challenge the current economic situation in the USA. But “settlement” is also inserted in our collective consciousness because it is an expression that has been used across geographic borders to refer to occupation and displacement, a non permanent habitat, a fabricated territory that results from imposed dominance. Two computers will be running the Max MSP program to control six firewire cameras each. The video generated by the cameras is projected by a video projector onto the wall. The images captured by the cameras are transformed into RGB data, that data will then trigger midi notes to compose the music of the installation. (in locations with internet access the data for the midi notes could be provided by data on house prices or other economic information). Parks & Passages (documentation) / video sketch and interactive video.